Prayer is a central facet of our faith as Jews. Many, however, find it overly rigid or not relevant to life in the modern era. 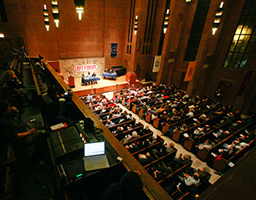 At Metropolitan Synagogue we work on the premise that prayer can indeed be engaging and can draw congregants together to reach out to God, with deeply felt words and music, in uniquely personal ways. Prayer services at the Metropolitan Synagogue include both traditional text recited together as a congregation, in Hebrew and English, as well as time for personal silent prayer and communing with God. Shabbat services are held Fridays 6:00pm-6:45pm, followed by a spirited kiddush. It is a musical, spiritual and uplifting service led by Rabbi Plaut. It also includes a brief but thought provoking topical talk by Rabbi Plaut. This service is the spiritual bedrock of our community and we hope to see you there. Better yet, bring a friend. For non-member tickets please call the synagogue at 212-679-8580 or buy them now via PayPal using the button below. For questions about membership and tickets to our High Holy Days services contact us at inquiries@metropolitansynagogue.org or (212) 679-8580. Tu Bishvat: The new year of the trees, in which new trees are planted. Purim: Celebrates the rescue of Persian Jews 2,300 years ago by Queen Esther with a carnival and noisemakers. Passover: Passover signals the birth of the Jewish nation, and recalls the Exodus of the Israelites from slavery in Egypt. Lag B'omer: The Omer period of 49 days from Pesach to Shavuot is a period of sadness, relieved by this 33rd day on which a plague suffered in Roman times supposedly terminated. It is frequently celebrated by outdoor celebrations for children and a disproportionate number of weddings, which cannot take place during the rest of Omer. Yom Hashoah: A day of remembrance for the victims of the Nazi Holocaust and for resistance fighters. Yom Hazikaron: Memorial Day for all those fallen in the battles of Israel. Yom Ha'atzma'ut: A modern festival celebrating Israel's independence is celebrated with prayers in the synagogues. Shavuot: One of the three pilgrim festivals when the Temple still stood in Jerusalem. It celebrates the revelation of the Torah at Mount Sinai and the wheat harvest. Synagogues are decorated with flowers and dairy foods are eaten. Tisha B'av: A full day fast mourning the destruction of the first and second Temples in Jerusalem and other tragedies in Jewish history. The Book of Lamentation is read. 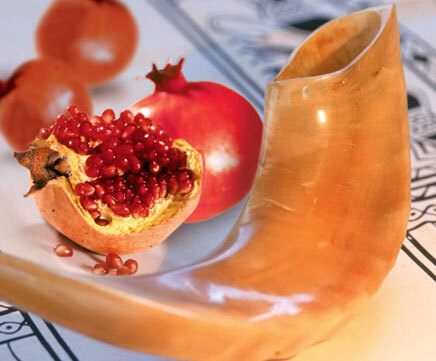 Rosh Hashana: New Year's Day, commemorates the creation of the world. The blowing of the ram's horn reminds Jews of Abraham's sacrifice of a ram in place of his son. This festival begins ten days of repentance and self-examination. Apples and pastry dipped in honey are eaten in the hope of a 'sweet' year. According to tradition, during this time, the names of the righteous are inscribed in the book of life, while those who have not repented are recorded for doom. The books are sealed are the holidays by tradition, making the judgment irrevocable. Yom Kippur: The Day of Atonement brings the ten days of repentance to an end. It is the holiest day of the year. Observant Jews neither eat nor drink for a full day. Sukkot: A harvest festival that also commemorates the forty years the children of Israel spent in the Sinai desert on the way from Egypt to Israel. Temporary huts (singular "suka," plural "Sukkoth") are built and used during this festival for meals and other family activities. The open roof is covered with branches and decorated with fruits. An important part of the festival is having a lulav and an etrog to bless. Simkhat Torah: The rejoicing of the Torah immediately follows Sukkot and celebrates the end of the annual cycle reading the Torah and its immediate re-commencement. All the scrolls of Torah, followed by the children singing and dancing, are paraded seven times around the synagogues. Hanukkah: Hanukkah celebrates the rededication of the temple in Jerusalem after the Maccabees in 164 BCE won it back from the Syrian Greeks. For the eight evenings of the festival, candles are lit on a special eight-branched candlestick, one on the first evening, two on the second and so on.